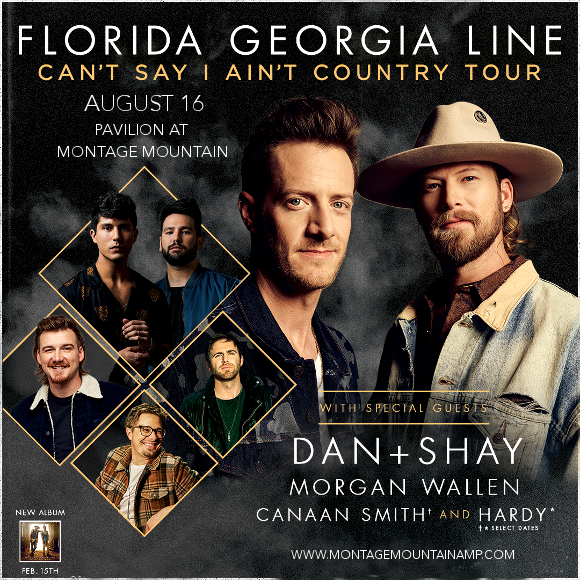 Bro-country fans, we’ve got the ultimate concert coming up for you at the Pavilion at Montage Mountain on Friday 16th August 2019!! That’s right, it’s the genre’s leading duo, Florida Georgia Line, with Dan and Shay and Morgan Wallen! What more could you possibly want out of one country concert?! Don’t miss this – hit the “Buy Tickets,” button NOW and grab those tix before they go!! It’s been a huge year for Tyler Hubbard and Brian Kelley, the members of Florida Georgia Line, with their worldwide tours for their last album “Dig Your Roots,” selling out across the planet, and most recently, their collaboration with Bebe Rexha, “Meant To Be,” earning the duo their first Grammy Award nomination!! The unexpected collaboration occurred when a collaboration gap, intended to be filled by Charlie Puth, suddenly opened up in Florida Georgia Line’s schedule, with Rexha stepping in to fill Puth’s shoes. Now, Florida Georgia Line have even more new music up their sleeves, with the release of the upcoming album “Can’t Say I Ain’t Country.” Expect old favorites and new surprises alike – what are you waiting for?? Grab those tickets while they last! !